Introduction: The importance of neurodegenerative diseases on the management of public health is growing and the real role of the environment and miRNA in their occurrence is still unclear. miRNA can significantly affect the regulatory network. The complex variety and gene-regulatory capacity of miRNAs are particularly valuable in the brain, being a very complex organ with a functional specialization of neurons highly adaptable to environmental stimuli. In particular, an miRNAs role is demonstrated in neurological diseases as an effect to toxic and mutagenic substances exposure by the environment. Objective: The focus was on the three most important neurodegenerative diseases: Alzheimer, Parkinson and Amyotrophic lateral sclerosis. Materials and Methods: A brief critical review on scientific papers of the last ten years using PuBMED, Scopus, Web of Science and Cochrane databases was carried out. Results: Several studies have shown that miRNAs may contribute to neurodegeneration process in response to environmental risks. The miRNAs are known to play a dynamic role in many biochemical pathways of mammalian's brain, including neuroplasticity, stress responses, cellular signaling, etc. miRNAs have a role in neurodegenerative phenotype of AD, PD and ALS. The environmental chemicals such as metals and pesticides and then behavior can cause miRNA alterations via increasing oxidative stress and/or triggering inflammatory responses. Conclusion: A discussion with theoretical and possible future research directions is provided and it is clear that the need is not only of longitudinal population studies and of better knowledge of epigenetics markers but, especially, of environmental policy interventions based on the green economy. Keywords: Brain, environmental exposure, epigenetic, miRNA, neurological damage, public health, risk. Keywords:Brain, environmental exposure, epigenetic, miRNA, neurological damage, public health, risk. Abstract:Introduction: The importance of neurodegenerative diseases on the management of public health is growing and the real role of the environment and miRNA in their occurrence is still unclear. miRNA can significantly affect the regulatory network. 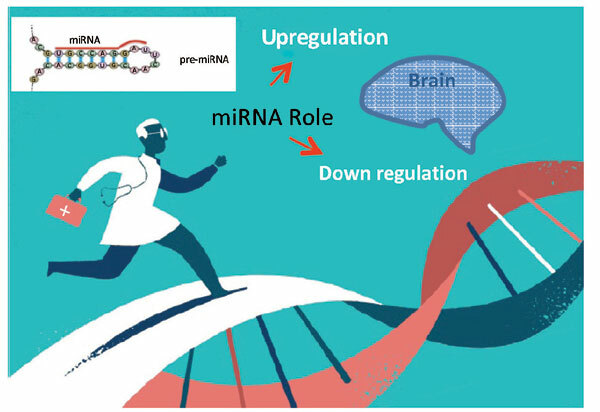 The complex variety and gene-regulatory capacity of miRNAs are particularly valuable in the brain, being a very complex organ with a functional specialization of neurons highly adaptable to environmental stimuli. In particular, an miRNAs role is demonstrated in neurological diseases as an effect to toxic and mutagenic substances exposure by the environment.